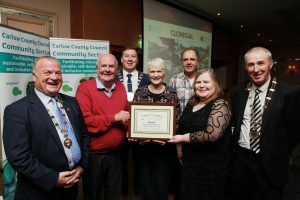 CARLOW County Council hosted a night of celebration recently in Mount Wolseley Hotel, Tullow for communities that participated in this year’s Pride of Place competition. The overall winner in the towns and villages category was the community of Clonegal, while Mount Leinster Park in Carlow town took the crown in the best estates section. The awards were presented by the county council’s cathaoirleach Brian O’Donoghue, mayor of Carlow cllr Ken Murnane and cathaoirleach of the Municipal District of Muinebheag cllr Willie Quinn. In all, the council presented over 60 prizes to the value of €20,000 to community groups throughout the county. “Collectively and individually you have had another fantastic year. I have had the opportunity as cathaoirleach to visit most of the towns and villages in the county and see first hand the fruits of your labour. I am proud to live in a beautiful, well-cared-for county,” said cllr O’Donoghue. The Michael Deering Cup was presented to Tullow Road Development Association by his son deputy Pat Deering in recognition for its community work with the people of that area. The Individual Award was presented to John Meaney from Leighlinbridge by Eileen Doyle, a representative of the Carlow Public Participation Network Secretariat, which sponsored that award.